After a construction project, there is often a large amount of debris left over, from scraps of building materials to wood shavings. 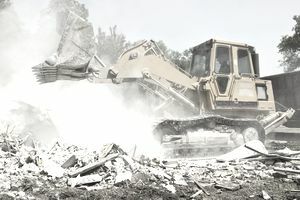 Depending on the size and scope of the project, having debris removed can be costly. Here is how to properly estimate your costs so you know a good deal when you find one. Define the area that is covered by the debris. Be specific and set your boundaries clearly. Differentiate between debris types and amounts. These quantities might be influenced by land use, grading and location. Divide the area into sections and classify them by debris type, such as vegetative, building supplies or metals. Carefully measure the debris area. You can perform representative samples or measure the entire area in feet and depth. Determine the equipment that will be used to complete the estimate, including surveyors, photos, tapes, roll-off wheel, and lasers. Determine and select the team that will be completing the debris removal estimate. Determine if debris removal activities will include removing personal property, such as furnishings, clothing or related indoor equipment. Take apart and clean all electronic devices and other harmful debris components, such as tires and oil storage containers. Recognize that some debris can undergo changes in volume during the handling process. For example, vegetative debris could reduce in volume after being loaded into dump trucks. Compare before and after aerial photos of the disaster area. If available, compare several photos taken at different angles. Select a reference object with a known dimension as a scale to perform comparative dimensional measurements. Consider a nominal value of uncertainty based on previous experience to account for areas not visible to aerial photography. Remember that some debris can undergo changes in volume during the handling process. Recent technological advances can also be useful when completing estimates of debris removal. Computer models such as FEMA’s HAZUS-MH software includes a modeling system that can be used to estimate debris generated by floods, tornadoes, earthquakes, and hurricanes. The United States Army Corps of Engineers (USACEHQ) has also developed technology that can be used to estimate debris removal quantities, designed mostly for hurricane and storm events. These computer modeling systems base their analysis on historical information, GIS data, land use, zoning and the information obtained by the disaster magnitude.